Tired of e-mail limitations ? Want to send larger files , here’s an alternative. 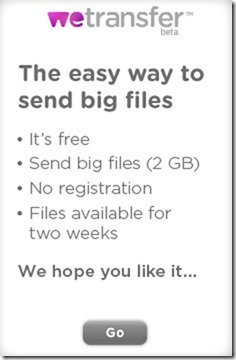 You can send files up to 2GB’s in size. And not only this you can send any number of files. WeTransfer also informs you when the receiver downloads the file. 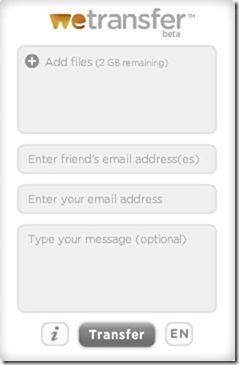 You can send a file to up to 20 recipients. What’s more , you always get a new and amazing background to see while sending your files. Note Files are held for 14 days before deletion. This is the welcome screen. When you press go , you will see a screen as shown below. The interface is very simple and easy. So start sending files now.